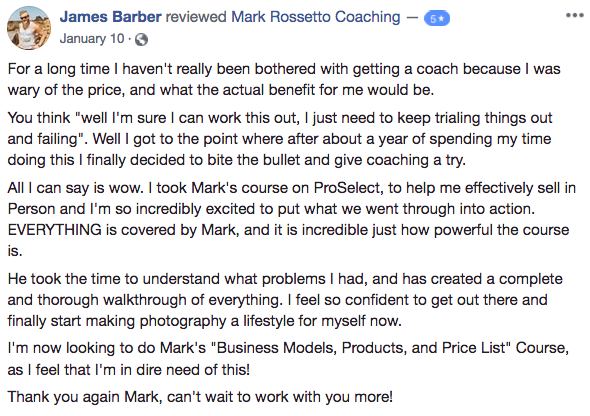 Read the amazing stories and client testimonials below and more recent on “Mark Rossetto Coaching” FB Page from some of the people that Mark has coached. The results speak for themselves. I’ve been shooting portraiture for a while now, so went into the “Become a master of in person sales” workshop, expecting just to pick up a few Proselect tips and tricks. I was really surprised to find that this workshop however covered the complete step-by-step customer buying experience, from initial contact to end delivery. This workshop is really laid out as a complete system to set yourself and your client up for not only a sale that makes both you and your client happy, but also ensures that you are providing exceptional customer service along the way. If you are just starting out, this workshop will give you a roadmap to follow, or if you are a seasoned pro, this workshop allows you to look at your entire client experience and work on the areas that need improvement (we all have some!). I’ve only had a chance to implement a few of the steps in this system, and have already seen an increase in the consistency of my sales as a result. Highly recommended to all portrait photographers. 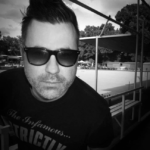 I own and run a busy little studio in Hobart which has been going for 7 or so years now. Mid 2015 I was in a bit of rut and the opportunity to hang out with Mark for the day came up…. 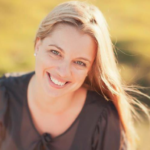 ‘tomorrow’ … I booked a flight to Melbourne that night for the red-eye the next day which turned out to be a life changing decision. I spent a whole day with Mark in his studio which was a really enlightening experience. 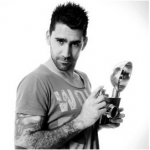 Mark was incredibly generous with his time and knowledge in all aspects of the portrait business. Mark, Your presentation this evening was one of the best I’ve attended in 41 years of seminars. It’s clear why you’re a star in the Australian portrait scene. 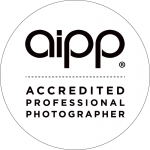 I have absolutely no doubt you’ll soon join the handful of brilliant mentors guiding professional photographers around the globe. “I am really looking forward to a future of implementing these strategies in my life and creating the success I know I deserve. 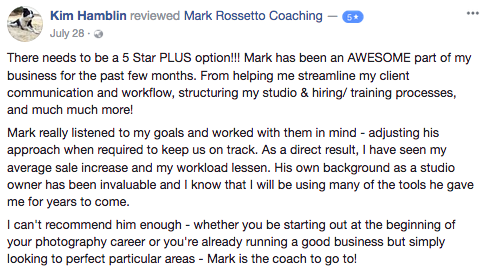 Thank you Mark – it has truly transformed my life being a part of this program and I can’t recommend it highly enough!! As a seminar junky, it’s not often that I fill an A5 notebook with pages of great notes and fabulous content that actually got me excited to be a photographer, in one two and a half hour session!! But that’s exactly what happened when I asked Mark if he would be a guest speaker at an AIPP seminar. I can honestly say that listening to him was brilliant! Not only did he make it fun but more importantly the content was exciting, fresh and do-able and I walked away with practical ideas that I could apply in my business the very next day. A very genuine thank you Mark for an extremely inspirational and informative evening! Having worked with other mentors and business coaches I found Mark to be so genuine in helping me find the right business structure to suit me and my family. He helped me to clear the clutter in my mind to see exactly what I wanted and what I needed to do to get me there. I didn’t want a cookie cutter solution to the issues I was having. I wanted a real solution to my needs and that is exactly what he was able to help me do. Working with Mark has given me clarity, motivation and a plan to move forward to achieve the results I am looking for at this stage of my life and career. Thank you Mark! Coaching with Mark was a very positive and motivating experience. It was great to look at my life holistically and then focus down on the areas that I really wanted to improve. Mark is a skilful coach who, with his insightful questions and great listening skills, helped me pinpoint my greatest challenges in maximising my efforts to accomplish my business goals; helped me set my priorities straight, and was instrumental in helping me put together a step-by-step plan to help me get unstuck in certain areas of my business and career. 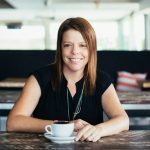 Coaching with Mark allowed me to figure out how I could combine my passion for photography and my education degree to build a business based on my strengths. Previously, I had been struggling with my own business due to past negative experiences, and fear prevented me from taking the steps necessary to make a success of it. 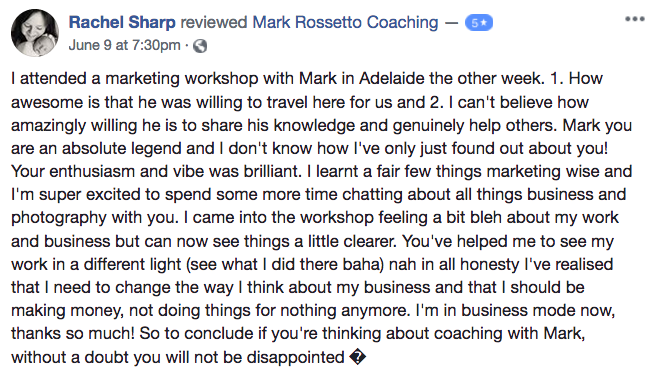 Mark’s coaching gave me the inspiration and tools to explore new ideas within my business and how I could make it work for me. What I was most grateful for was that Mark really listened to me and understood my personal challenges. The steps he suggested were practical and doable for my personal situation. I cannot thank Mark enough! 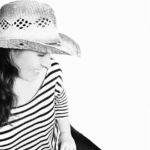 I started working with Mark after renaming and rebranding my business (like starting all over again). Before starting business coaching with him, I attended his Shoot to Sell workshop, which was in itself a goldmine of information. Learning ProSelect and in-person sales techniques has been invaluable in bringing my average sales up from $400 to $1400 within the first couple of months. I have since also attended his Marketing your Business workshop which was absolutely fantastic. It was filled ideas and direction to get a Marketing strategy up and happening immediately. 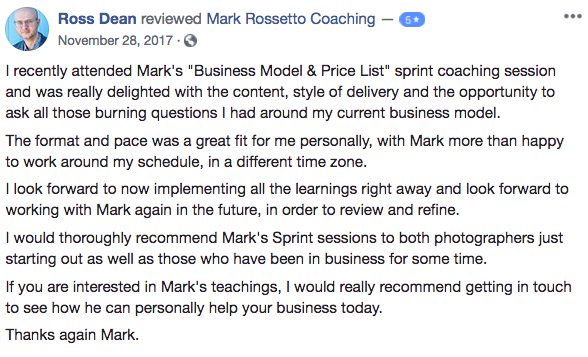 By honing and revising my products and pricing, implementing marketing and business practices, and not to mention his ongoing positive support and wise words, with Mark my business has consistently made huge leaps of improvement in countless ways. He has been invaluable and my business would not be moving forward like this without him. He is patient and attentive and an all round top guy. 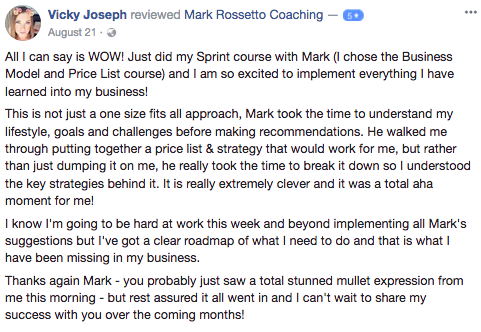 I highly recommend Mark to anyone looking for a business coach who will put them back on track.